Q. When and how did you enter the Indian Exhibition Industry? A. My first brush with the exhibition industry took place in the year 1988-89, when the Association, I was then working with, decided to organise its own international exhibition in India. The exhibition industry was in a nascent stage then with few large exhibitions taking place. It was in 1993 that I handled the first exhibition independently in New Delhi and later in Mumbai. Then there was no stop for me till my retirement in 20110. Q. When was FairAct established? What was the objective and what are the major milestones it has crossed over these years? A. Organizing an event whether it is an exhibition or a conference, is seemingly an overwhelming task and requires multi-faceted skill sets since diverse activities are involved. Apart from marketing, the event and securing participants, the exhibition organizer also needs to carry out many activities such as choosing the venue, negotiating numerous contracts, making travel and hotel arrangements etc. In addition, it is necessary to organize various exhibition services, promote the event to potential customers as well as planning and implementing the innumerable details that form the logistics of any event. Naturally, the exhibition organizers choose to partner with professional service providers to handle the event successfully. Management of exhibitions is however a challenging task even for the seasoned event management professionals and cannot be handled by non-professionals. Rather, it can easily be classified as one of the tough and demanding jobs. However, it is also fun, exciting, exhilarating, stimulating and never-ever boring. Considering the need of the exhibition organizers and with experience gained during the 25 odd years, we, three partners decided to create a company which could assist the exhibition organizers in managing their events. Thus, FairAct was born in the year 2011. Q. Kindly elaborate on the event management services offered by your company. How do they stand out in the market compared to your competitors? A. FairAct offers end-to-end management services to exhibition organizers. In other words, we offer complete management support to exhibition organizers except for the marketing of the event and sometimes, PR and promotional activities. It is interesting to mention here that most of the exhibition organizers would like to ensure that they get good number of exhibitors and visitors for their show and hence, like to involve themselves in marketing as well as PR and promotion of the show. The rest of the activities are basically operational, where FairAct plays a role. These services also include interface with exhibitors, vendor shortlisting and supervision as well as ensuring deliverables by vendors, venue possession and handing over, logistics, construction and dismantling of hangers, stands etc. Though FairAct offers a variety of services, the exhibition organizers choose the required services based on their internal capabilities. For example, some exhibition organizers like to continue their interaction with exhibitors after the booking process is over, whereas some organizers hand over the work to the event managers, involving interaction with exhibitors for their requirements, show directory entries etc. Q. FairAct is also into organizing trade shows and you have an upcoming show in August – PowerElec Ghana. What are its major highlights? A. Yes, we are also organizing our own shows, including PowerElec GHANA, which will be held in Accra, the capital of Ghana. The show will have about 150 exhibitors from 14 countries including country pavilions from India, Turkey and China. The Indian Pavilion is supported by FIEO with financial assistance under the MAI grant. 45 exhibitors from India will be participating. We have embarked upon an ambitious PR and promotion plan for the event and are expecting a good number of quality visitors to the show. Q. Kindly tell us more about the kind of shows you organize. Which are the other upcoming shows & their highlights? A. Apart from PowerElec GHANA, we are organizing three more shows in Accra, Ghana. We are also organizing Ghana Motor Show and Auto Parts West Africa Show in September 2017. Q. Why do you choose a foreign land for organizing trade shows? How different and difficult is it from organizing shows within the country? A. Not only foreign land, we also organized trade shows in Kolkata in 2015 and are planning one more in Kochi this December. The idea is to organize events in cities, which are not yet explored though they have potential and interest. We were looking beyond our boundaries for the very reason and we found that West Africa apart from Nigeria, is a market not explored by exhibitors both from India and other countries. Ghana was a natural choice as it was the second-largest country in the region after Nigeria, unexplored to a great extent, English speaking and comparatively peaceful and potential market. It is difficult in a sense that the market is relatively unknown, vendors are few and not as professional as developed or semi-developed countries, materials is a challenge and business being on the initial stage, the costs are high. It was a challenge when we organised our first event PowerElec GHANA last year, to gather all pieces together. This year, we are wiser and more experienced as compared to the last year. Q. What is your marketing strategy for promoting these exhibitions? How do you promote your shows? A. The PR and promoting strategy is similar to the strategy used anywhere in the exhibition industry over the world. Our approach is four-fold: Direct communication and distribution, press releases and advertisements in print, electronic and digital media, hoardings and social media. In Ghana, we are using a novel method to inform about our shows, the success of which will be known only after the shows. Ghana has a predominantly large Christian community, which attend Sunday masses regularly. We are advertising our shows and distributing leaflets outside major churches in the city as a test effort this time. If successful, we will try the same on a larger scale next time. Q. What has been logistically the most promising, yet the most challenging project for you so far and why? A. I would recall two projects rather than one since these two had common challenges and also those witnessed the confidence of the organisers in FairAct. Both AIPMA and ITME Society had given us the tasks knowing that we would deliver to their satisfaction. And it was a great responsibility on FairAct to ensure that their expectations were met. In both these exhibitions, Plastivision and ITME, the challenges were many as those were both very large exhibitions, spread over the venue with about 1,000 exhibitors and more than 10,000 visitors visiting every day. The main challenge was to construct extra hangers as both exhibitions have grown beyond the present capacity of the venue. These were to be constructed and dismantled in shortest possible time. Erection of AC handling units as well as arranging electric supply to them and keeping those running without break-downs was a stupendous task as those were temporary arrangements. Both exhibitions had heavy machinery and process equipment as exhibits, which required careful movement and handling so as to have minimum disturbance to neighbouring exhibitors and their contractors constructing their stalls. Another challenge was to ensure electrical and air supply as many of the process equipment exhibited. were working during the shows to demonstrate their capabilities. Being crowded exhibitions, the security of the materials and belongings and the safety of the people were were another concerns. These challenges were mostly under our control but one challenge which was not really in our control was the traffic movement outside the venue. The Western Express Highway faces huge traffic jams during the morning and evenings. The large number of vehicles reaching and leaving the venue during the exhibition days create a nightmare on the service road and the highway with long traffic jams. The help of Mumbai Police is very vital in controlling and regulating the traffic movement. Q. What are your other upcoming plans for FairAct? A. FairAct apart from its management services, has also started offering turn-key solutions to exhibition organizers, who are interested in having a single-point contact for all their needs. We have already done two such shows last year and will probably be doing four shows this year on turnkey basis. A. We are not affected by GST. As an Indian company, we support the Government’s move towards a single rate of taxation. In fact, we hope the first major hurdle faced by the Exhibition Industry; viz restricted movement of exhibits and exhibition materials across borders will be the thing of the past. All logistic companies should be happy about this change. Our company particularly, may be benefitted as both goods and services are under one tax regime now. Q. Based on the immense experience you have gained in the Indian Exhibition Industry and in the International Market, where do you see the Indian Exhibition Industry in the coming years? A. 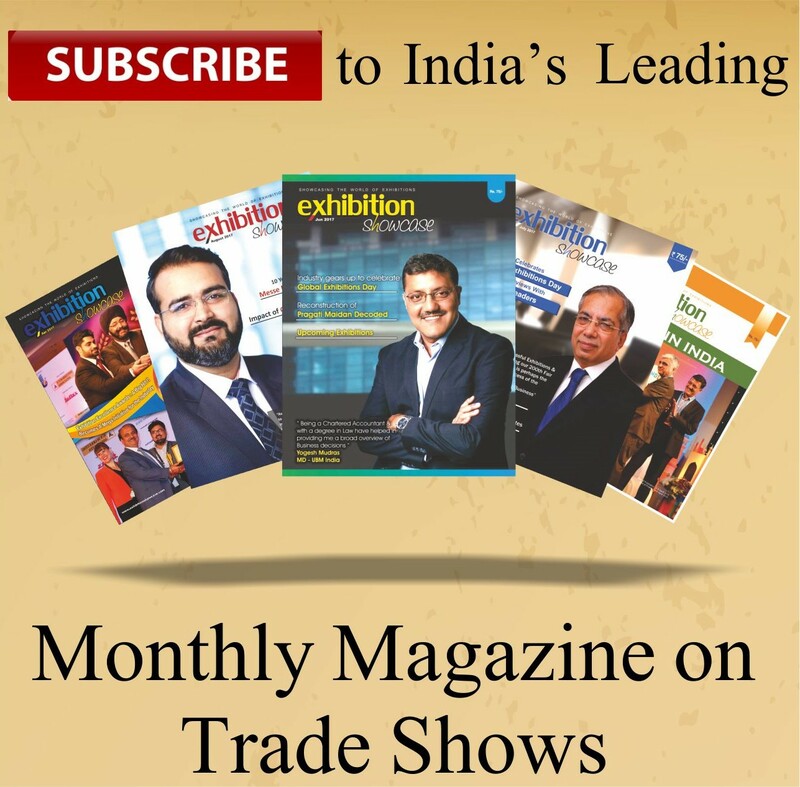 The prospects for Indian Exhibition Industry are very promising. The industry has presently touched only the ‘A’ class and to very little extent some’B’ class cities. With the country prospering, there exists a large consumer base in the ‘B’ and ‘C’ Class cities which are not tapped as yet. I see immediate business prospects for B2C exhibitions in such cities in immediate future, followed by B2B shows happening in selected industrial towns. However, one word of caution will be to explore these emerging markets after research and study.